UK Prime Minister Theresa May could try to bounce her cabinet into a final decision on Brexit on Tuesday, the Irish Independent understands. There is growing optimism that the ‘moment of truth’ is coming after months of painful negotiations between the EU and UK. Sources say the UK government is now determined to find an answer to get the so-called ‘Irish question’ over the line in the coming days. Mrs May’s divided cabinet could meet as early as Tuesday to thrash out the final wording, in a move that would facilitate a special meeting of EU leaders on November 21 and 22. A source said: “There is a real push on now to avoid a nightmare before Christmas scenario.” The prime minister’s deputy, David Lidington, was in Dublin yesterday, where he said a breakthrough is “very close”. The latest proposal on the table involves a ‘two-speed backstop’ whereby the whole UK will sign-up to a customs arrangement with the EU. Northern Ireland would remain fully aligned to EU trade rules to ensure the movement of goods across the Border continues without the need for customs checks. And England, Scotland and Wales would be tied into a ‘bare bones’ customs arrangement, in which it would apply a common external tariff on imports from outside the union and rules of origin. This would be enough to prevent the need for checks on goods travelling across the Irish Sea. Asked by the Irish Independent whether the UK could finalise a deal next Tuesday, Mr Lidington said: “I’ve been in politics long enough to know that if I give you a prediction or hype up a particular meeting for when a deal is likely to be clinched, it’s bound to the wrong. However, the minister for the Cabinet Office said he could not “emphasise strongly enough the prime minister feels absolutely committed to her pledge not to have under any circumstances a hard Border on the island of Ireland”. He said it matters both in “economic terms” and “symbolically” that people can continue to travel across the island without interruption. Tánaiste and Foreign Affairs Minister Simon Coveney said both men agreed a withdrawal agreement can be secured in the coming weeks. In a clear sign progress is being made, Mr Coveney has met the UK’s foreign secretary, Brexit secretary and Mr Lidington this week. However, he warned “some movement” is still needed on the UK side. “I think a deal can be done but I think it’s important that the commitments that have been made are followed through on in full,” he said. While Mr Lidington was in Dublin, UK Brexit Secretary Dominic Raab made a flying visit to Northern Ireland. He visited two sea ports before meeting a number of local political parties. 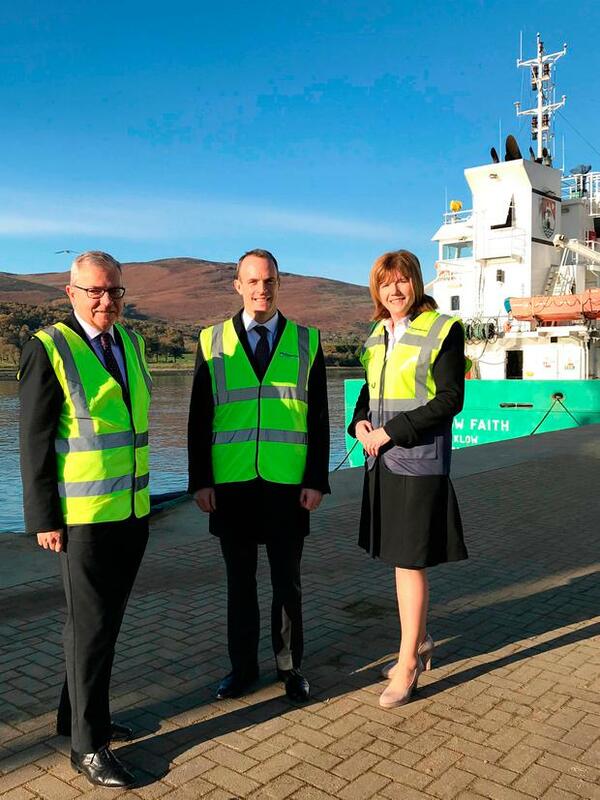 Mr Raab heard opposing views from the two biggest parties, the DUP and Sinn Féin. The DUP urged there be no additional barriers between Northern Ireland and the rest of the UK after Brexit. Sinn Féin told him that the UK government must agree to a backstop plan which could see Northern Ireland effectively remaining in the customs union and single market. However, Mr Raab insisted he is confident his government can get a “good deal”. “We have made it very clear we would never sign up to anything that would threaten the economic, the constitutional, let alone the territorial integrity of the United Kingdom,” he said.